Largely unknown to the outside world, Nepal’s centuries-old institution of the child deity, the Kumari Devi, is deeply embedded in the culture of Kathmandu Valley. Young, beautiful and decorous, even a glimpse of her is believed to bring good fortune. Kumaris are drawn from the Newar community, the original inhabitants of the Kathmandu Valley for whom planets, karma and an array of gods play a vital role in day-to-day life. Gautam Shakya, in the eleventh generation of Kumari caretakers, says they are Buddhists who adopted the Hindu caste system and embody harmony. “One doesn’t discriminate against the other. We Newars are Buddhist. The Kumari is from a Buddhist family — but she is a Hindu goddess,” he says. The secretive world of the Kumari generates its own lore, including tales about initiation rites filled with demons and the heads of dead animals. Bajracharya says there was nothing so terrifying, but recalls her own investiture was frightening enough. Actually the room was quite scary, only lit through oil lamps. But then when you get the power of the goddess you don’t get scared at all. Even though I was 5 years old I was sitting there quite calm. The Kumari is believed to be the incarnation of the fearsome Hindu goddess Durga. One myth — and there are several — has Durga visiting the king of the Malla dynasty each night until the king makes sexual advances … and the goddess vanishes in fury. She then appears to the king in a dream telling him: “Find a child from the Shakya caste. I will enter her soul and you can worship her as you worshipped me.” The king complies, and the belief in the world’s only Living Goddess is born. My behavior is not in my control … There is someone supreme over me that makes me listen to their prayers or just ignore them. You feel, you know, supreme. You’re not you, actually. 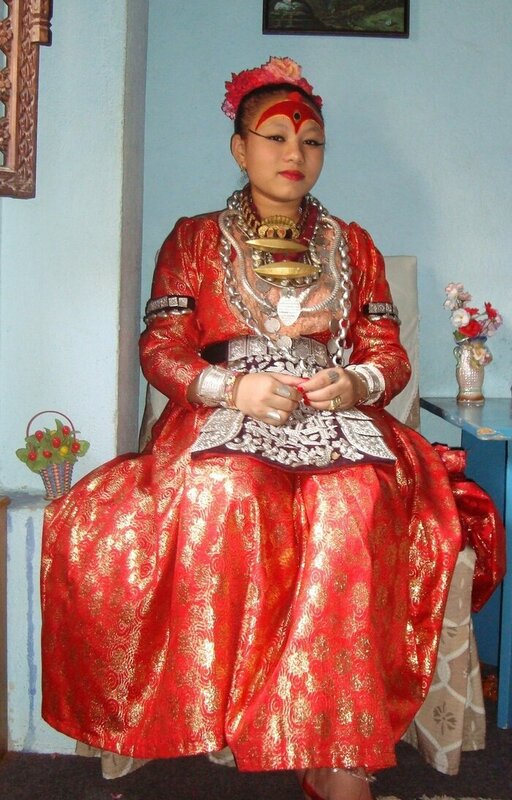 Before Nepal’s monarchy was abolished in 2008, kings would seek the Kumari’s blessing. Later, the president bowed before her. Human rights activist and lawyer Sapana Pradhan Malla says “with everyone surrendering themselves to her” there’s little wonder the Kumari feels “supreme.” “Yes, she inherited this power because of the culture, because of the religion and also the state itself is practicing this culture to make her powerful,” Malla says. The government subsidizes Kumaris with a small stipend in recognition of their service. There is information we cannot divulge. When she’s conversing in the temple with the priests — she’s god-like. It’s a mystery. It’s sacred. And if we tell all of the secrets, she’ll no longer be a goddess, but just a common woman. Previous Previous post: Is the Schooling System Against Reading?